Jim snr. has been a passionate fisherman for a great many years and for more than 40 of those years has fished for carp. His first carp was caught at Pippingford Manor in 1966 (weighing just 8lb) on a Chapman 500 split cane rod and this year he managed a stunning 48lb common from his own lake on exactly the same set up. With a real love of the countryside , wildlife and photography as well as fishing, Jim is well suited to 'living the dream' at Le Moulin du Mee. Lottie is his 'better half' and she ensures that the place runs smoothly and as such is an important member of the Le Moulin du Mee team. Jimmy is the chap that gets things done !! Whether it be helping anglers move their tackle, baiting up from the boat or just general giving of advice Jimmy is the man that you want. Having fished since he was a lad he manages to catch more than his fair share of carp from LMDM and so far has managed to better his father by almost 20lb by landing the 'Saddleback Common' at a tad over 68lb. 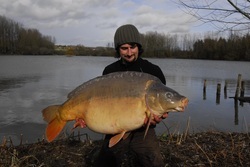 Together with his partner Sophie Jimmy also handles the running of our second lake, Poppy's. This little gem is fast catching up with the main lake and is being managed to eventually be far more than just another 'runs water'.